Can benchmarking your prime lamb production achieve what is possible? TOP prime lamb producers in a leading Australian benchmarking dataset achieved a $25/dry sheep equivalent profit last financial year, more than double the return of other participants. 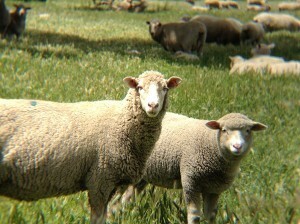 But opinions differ on what this means to other sheep producers and how they should rank the importance of benchmarking. Meat & Livestock Australia this week released details on how the to 20 percent of prime lamb enterprises achieved a profit of $25/DSE in the 2015-16 Holmes Sackett Benchmarking dataset. The average profit for benchmarking participants was $10/DSE. That means there are producers out there making two-and-a-half times the profit of the average of all benchmarking participants, MLA said. The 2015-16 benchmarking project analysed the performance of 57 specialist prime lamb enterprises in NSW, Tasmania, South Australia and Victoria with an average flock size of 10,500 ewes joined. How can one producer make so much more profit than another? It comes down to key benchmarks and understanding profit is driven by how much you produce, what it cost to produce it, the end product and what you are paid for it, MLA said. MLA said while sale price has a large influence over profit, the dataset illustrated efficiency of lamb production is the main source of variation on profits between producers. Despite the industry focus on lifting weaning percentages, you only need a consistent 120pc weaning rate to achieve top 20pc profit levels, MLA said. 250g/day growth rate to sale. Producers get caught up on weaning percentages, without measuring growth rates which have far greater bearing on variation in profitability. a cost of production of $78/ewe joined (comprising $22 for labour, $14 pasture, $7 animal health, $9 shearing and crutching, $10 selling costs and $16 overheads). However, Victorian sheep consultant Nathan Scott said in his AchieveAG Solutions blog this week that benchmarking is actually just comparative analysis. It doesn’t provide “benchmarks” to aim for, just indications of what others are achieving, he said. “I believe our industry is far too fixated upon being average, or better than average, or in the top 20pc. “All of that would be fine if I thought we were anywhere near our potential,” he said. “If benchmarking is how we set our sights for the future, then all we will ever be is better than the rest. “But what if the rest really aren’t doing that well at all, and being better than them still doesn’t get us anywhere near where we need to be? Mr Scott said. Mr Scott said his frustration isn’t with benchmarking itself, but with the way that it is used, and the very real potential for it to justify someone’s current level of performance rather than drive improvement. “We are better than that. Click here to read Nathan Scott’s blog – We can be better than just benchmarking! Holmes and Sackett consultant Sandy McEachern explains the HS datasets key benchmarks in detail, along with how producers can focus on these in your business, in this Making More From Sheep webinar. Find out more about MLA’s Profitable Grazing Program and BusinessEDGE training.